You are welcome to schedule an inspection appointment. At this appointment, we will subject your vintage car to a detailed examination and discuss the next steps with you. If your vintage gem is not roadworthy, you can have it collected by our transport service, which is specialised in transporting vintage and classic cars. Alternatively, we can visit you for an on-site inspection. Should you decide to have repair work carried out by SCHAD Oldtimer Manufaktur, our next step is to contact the insurer. At this stage, the scope of the repair work and the costs are agreed so that the work can begin. In close cooperation with you and with the insurance company’s appraiser, we prepare a detailed cost estimate for the repair work. Throughout the process, we remain available at all times to support all parties involved and to answer their questions. Once the costs have been approved, we immediately begin the repair work. We draw on all the expertise and experience that we at SCHAD Oldtimer Manufaktur have to offer. 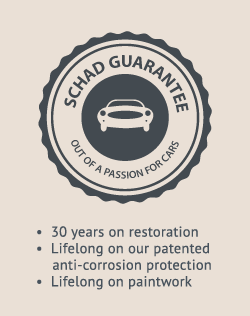 The name SCHAD is synonymous with highest-quality restoration, and we are one of the best vintage automotive restorers in Europe. In the course of the repair work, every step is precisely documented, and any variation from the original repair plan is discussed with and approved by all parties involved. As soon as the repair work is completed, your treasure is returned to you. We bill the repair costs directly to the insurers, leaving you free to immediately begin enjoying the pleasure of driving your vintage car again. At SCHAD Oldtimer Manufaktur, we have been taking care of automotive treasures for more than 30 years. With fine craftsmanship and state-of-the-art technologies, we repair and restore both vintage and classic cars with the greatest possible authenticity. In doing so, we draw on the whole range of experience available at SCHAD Originale. All necessary work is carried out by highly qualified experts. Several master craftsmen are employed in every area. We produce many replacement parts ourselves, crafting them by hand. In our bodywork and painting workshop, we can flawlessly reproduce even historical paints. With our patented anti-corrosion protection, we preserve originals for all time. And at our location in the Klassikstadt, the vintage and classic car centre in Frankfurt am Main, we specialise exclusively in vintage Mercedes-Benz models.